“Those seeking a grand overview of science’s greatest hits over the past century will find it here” (The Washington Post). Peter Watson’s bold history of science offers a powerful argument—that the many disparate scientific branches are converging on the same truths. 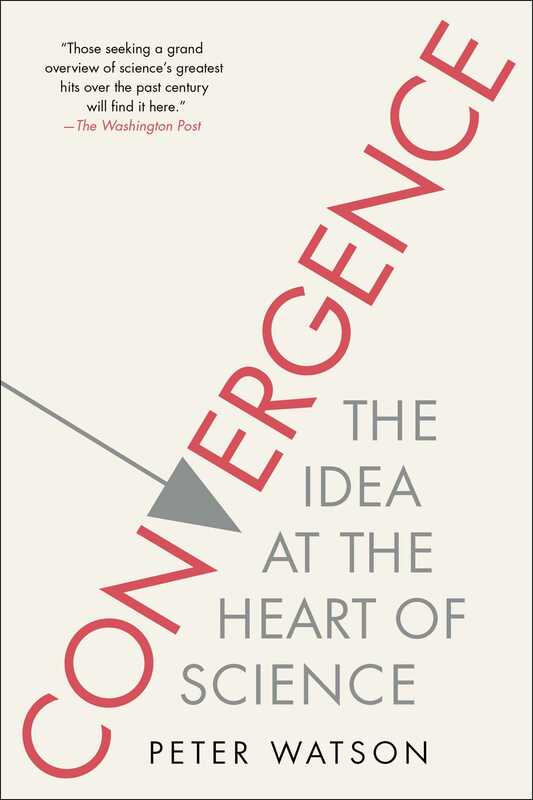 Convergence is a history of modern science with an original and significant twist. Various scientific disciplines, despite their very different beginnings, have been coming together over the years, converging and coalescing. Intimate connections have been discovered between physics and chemistry, psychology and biology, genetics and linguistics. In this groundbreaking book, Peter Watson identifies one extraordinary master narrative, capturing how the sciences are slowly resolving into one overwhelming, interlocking story about the universe. Watson begins his narrative in the 1850s, the decade when, he argues, the convergence of the sciences began. The idea of the conservation of energy was introduced in this decade, as was Darwin’s theory of evolution—both of which rocketed the sciences forward and revealed unimagined interconnections and overlaps between disciplines. Decade after decade, the story captures every major scientific advance en route to the present, proceeding like a cosmic detective story, or the world’s most massive code-breaking effort. “Fascinating…Highly recommended…Watson treats biology, chemistry, and physics as entangled plotlines, and readers’ excitement will build as more connections are made” (Library Journal, starred review). Told through the eyes of the scientists themselves, charting each discovery and breakthrough, Convergence is a “massive tour de force” (Publishers Weekly) and a gripping way to learn what we now know about the universe and where our inquiries are heading. One morning in late August 1847, James Prescott Joule, a wealthy Manchester brewer but also a distinguished physicist, was walking in Switzerland, near Saint-Martin, beneath the Col de la Forclaz, in the south of the country, not too far from the Italian border. On the road between Saint-Martin and Saint-Gervais he was surprised to meet a colleague, William Thomson, a fellow physicist, later even more distinguished as Lord Kelvin. Thomson noted in a letter the next day to his father—a professor of mathematics—that Joule had with him some very sensitive thermometers and asked if Thomson would assist him in an unusual experiment: he wanted to measure the temperature of the water at the top and bottom of a local waterfall. The request was particularly unusual, Thomson suggested in his letter, because Joule was then on his honeymoon. The experiment with waterfalls came to nothing. There was so much spray and splash at the foot of the local cataract that neither Joule nor Thomson could get close enough to the main body of water to make measurements. But the idea was ingenious and it was, moreover, very much a child of its time. Joule was homing in on a notion that, it is no exaggeration to say, would prove to be one of the two most important scientific ideas of all time, and a significant new view of nature. He was not alone. Over the previous few years as many as fifteen scientists, working in Germany, Holland, and France as well as in Britain, were all thinking about the conservation of energy. The historian of science Thomas Kuhn says that there is “no more striking instance of the phenomenon known as simultaneous discovery than conservation of energy.” Four of the men—Sadi Carnot in Paris in 1832, Marc Seguin in Lyon in 1839, Carl Holtzmann in Mannheim in 1845, and Gustave-Adolphe Hirn in Mulhouse in 1854—had all recorded their independent convictions that heat and work are quantitatively interchangeable. Between 1837 and 1844, Karl Mohr in Koblenz, William Grove and Michael Faraday in London, and Justus von Liebig in Giessen all described the world of phenomena “as manifesting but a single ‘force,’ one which could appear in electrical, thermal, dynamical, and many other forms but which could never, in all its transformations, be created or destroyed.”1 And between 1842 and 1847, the hypothesis of energy conservation was publicly announced, says Kuhn, by four “widely scattered” European scientists—Julius von Mayer in Tübingen, James Joule in Manchester, Ludwig Colding in Copenhagen, and Hermann von Helmholtz in Berlin, all but the last working in complete ignorance of the others. Joule and his waterfalls apart, perhaps the most romantic of the different stories was that of Julius von Mayer. For the whole of 1840, starting in February, Julius Robert von Mayer served as a ship’s physician on board a Dutch merchantman to the East Indies. The son of an apothecary from Heilbronn, Württemberg, he was a saturnine, bespectacled man who, in the fashion of his time, wore his beard under—but not actually on—his chin. Mayer’s life and career interlocked in intellectually productive yet otherwise tragic ways. While a student he was arrested and briefly imprisoned for wearing the colors of a prohibited organization. He was also expelled for a year and spent the time traveling, notably to the Dutch East Indies, a lucky destination for him, as it turned out. Mayer graduated in medicine from the University of Tübingen in 1838, though physics was really his first love, and that was when he enlisted as a ship’s doctor with the Dutch East India Company. The return to the East was to have momentous consequences. Mayer was struck by this observation because it seemed to him to be self-evident support for the theory of his compatriot, the chemist and agricultural specialist Justus von Liebig, who argued that animal heat is produced by combustion—oxidation—of the chemicals in the food taken in by the body. In effect, Liebig was observing that chemical “force” (as the term was then used), which is latent in food, was being converted into (body) heat. Since the only “force” that enters animals is their food (their fuel) and the only form of force they display is activity and heat, then these two forces must always—by definition—be in balance. There was nowhere else for the force in the food to go. Mayer originally tried to publish his work in the prestigious Annalen der Physik und Chemie. Founded in 1790, the Annalen der Physik was itself a symptom of the changes taking place. By the 1840s it was the most important German journal of physics, though many new journals proliferated in that decade. The Annalen’s editor since 1824, Johann Christian Poggendorff, a “fact-obsessed experimentalist and scientific biographer,” had a very firm idea of what physics was. By the middle of the century, there had emerged “a distinctive science of physics that took quantification and the search for mathematical laws as its universal aims.” (This, it will be recalled, is what drew Mary Somerville to the subject.) Poggendorff could make or break scientific careers. All the more so because he edited the Annalen for fifty-two years, until he died in 1877. Owing to a number of basic mistakes, however, due to his poor knowledge of physics, Mayer’s paper was rejected by Poggendorff. Disappointed but undeterred, he broached his ideas to the physics professor at Tübingen, his old university, who disagreed with him but suggested some experiments he might do to further develop his ideas. If what Mayer was proposing was true, the professor said, if heat and motion are essentially the same, water should be warmed by vibration, the same thought that had occurred to Joule. These experiments, ideas, and observations of Mayer and Joule did not come quite out of the blue. Throughout the early nineteenth century, and apart from Liebig’s observations, provocative experimental results had been obtained for some time. In 1799, Alessandro Volta, in Como, north Italy, had stunned the world with his invention of the battery, in which two different metals, laid alternately together in a weak solution of salt, like a multilayered sandwich, generated an electric current. In 1820 Hans Christian Ørsted, in Copenhagen, had noticed that a magnetized compass needle was deflected from magnetic north when an electric current from a battery was switched on and off and passed through a wire near the needle. Five months later, in September that same year, in London, Michael Faraday, working in his basement laboratory in the Royal Institution in Albemarle Street, repeated Ørsted’s experiment, and found the same result. Then he moved on to new ground. He brought together a cork, some wire, a glass jar, and a silver cup. He inserted the wire into the cork and put some water in a jar with mercury lying at the bottom. Then he floated the cork in the water, in such a way that the end of the wire in the cork made contact with the mercury. Faraday next fixed the top of the wire into an inverted silver cup with a globule of mercury held under its rim. When connected to a battery, this comprised a circuit that would allow the wire to flex without breaking the flow of electricity. Next, he brought up a magnet near the wire—and it moved. He repeated the action on the other side of the wire, with the same result. In Volta’s battery, chemical forces produced electricity, Ørsted had demonstrated a link between electricity and magnetism, and in Faraday’s experiments, electricity and magnetism together produced movement. On top of this, the new technology of photography, invented in the 1830s, used light to produce chemical reactions. Above all, there was the steam engine, a machine for producing mechanical force from heat. Steam technology would lead to the most productive transformations of all, at least for a time. During the 1830s and 1840s the demand for motive power soared. In an age of colonial expansion, the appetite for railways and steamships was insatiable, and these needed to be made more efficient, with less and less leakage of power, of energy. The other men who did most, at least to begin with, to explore the conservation of energy—Joule and William Thomson in Britain, Hermann von Helmholtz and Rudolf Clausius in Germany—fared better than Mayer, though there were interminable wrangles in the mid-nineteenth century as to who had discovered what first. Joule (1818–89), born into a brewing family from Salford, had a Victorian—one might almost say imperial—mane, hair which reached almost as far down his back as his beard did down his front: his head was awash in hair. He is known for just one thing, but it was and is an important thing and was one for which he conducted experiments over a number of years to provide an ever more accurate explanation. As a young man he had worked in the family’s brewery, which may have ignited his interest in heat. This interest was no doubt fanned all the more when he was sent to study chemistry in Manchester with John Dalton. Dalton was famous for his atomic theory—the idea that each chemical element was made up of different kinds of atoms, and that the key difference between different atoms was their weight. Dalton thought that these “elementary elements” could be neither created nor destroyed, based on his observations which showed that different elements combined to produce substances which contained the elements in set proportions, with nothing left over. And gradually people were won over. For example, Joule addressed several meetings of the British Association for the Advancement of Science, in 1842, and again in 1847. In between these meetings, Mayer published his observations, about body heat and blood color, but Joule had the momentum and, in the BAAS, the stage. The BAAS was well established then, having been founded in 1831, in York, modeled on the German Gesellschaft Deutscher Naturforscher und Ärzte. It held annual meetings in different British cities each year. But Joule needed only one individual in his BAAS audience to find what he had to say important, and that moment came in the 1847 meeting, when his ideas were picked up on by a young man of twenty-one. He was then named William Thomson but he would, in time, become better known as Lord Kelvin. Just as Joule befriended the older Dalton, so he befriended the younger Thomson. In fact, he worked with Thomson on the theory of gases and how they cool and how all that related to Dalton’s atomic theory. Joule was in particular interested in nailing the exact average speed at which molecules of gas move (movement that was of course related to their temperature). He focused on hydrogen and treated it as being made up of tiny particles bouncing off one another and off the walls of whatever container they were held in. By manipulating the temperature and the pressure, which affected the volume in predictable ways, he was able to calculate that, at a temperature of sixty degrees Fahrenheit and a pressure of thirty inches of mercury (more or less room temperature and pressure), the particles of gas move at 6,225.54 feet per second. Similarly, with oxygen, the molecules of which weigh sixteen times those of hydrogen, and since the inverse-square lawI applies, in ordinary air the oxygen molecules move at a quarter of the speed of hydrogen molecules, or 1,556.39 feet per second. To pin down such infinitesimal activity was an amazing feat, and Joule was invited to address the Royal Society and elected a fellow, more than making up for his earlier rejection. Thomson followed on where Joule left off. Born in Belfast in June 1824, he spent almost all his life in university environments. His father was professor of mathematics at the Royal Belfast Academical Institution, a forerunner of Belfast University, and William and his brother were educated at home by their father (his brother James also became a physicist). Their mother died when William was six, and in 1832 their father moved to Glasgow, where again he became professor of mathematics. As a special dispensation, both his sons were allowed to attend lectures there, matriculating in 1834, when William was ten. After Glasgow, William was due to go to Cambridge, but there were concerns that graduating in Glasgow might “disadvantage” his prospects down south, so although he passed his finals and the MA exams a year later, he did not formally graduate. At the time, he therefore signed himself as William Thomson BATAIAP (Bachelor of Arts To All Intents And Purposes). Thomson was much more than a scientist. He had a hand in the first working transatlantic telegraph, between Great Britain and the USA (after other attempts had failed), which transformed communication almost as much as, and maybe more than, the Internet of today. He made money from his scientific and industrial patents, to such an extent that he was, first, knighted in 1866 and then made Baron Kelvin of Largs in 1892 (the River Largs runs through the campus of Glasgow University). On top of all this, Kelvin established the absolute scale of temperature, which also stems from the idea that heat is equivalent to work (as Joule had spent his lifetime demonstrating) and that a particular change in temperature is equivalent to a particular amount of work. This carries the implication that there is in fact an absolute minimum possible temperature: –273° Fahrenheit, now written as 0°K (for Kelvin), when no more work can be done and no more heat can be extracted from a system. Like Mayer, he had sent his paper to Poggendorff at the Annalen der Physik but was rebuffed, and he chose to publish his pamphlet privately. And, like Mayer, von Helmholtz approached the problem of energy from a medical perspective. His previous physiological publications had all been designed to show how the heat of animal bodies and their muscular activity could be traced to the oxidation of food—that the human engine was little different from the steam engine. He did not think there were forces entirely peculiar to living things but insisted instead that organic life was the result of forces that were “modifications” of those operating in the inorganic realm. He had parallel ideas not just with Mayer and Kelvin, but with Liebig too. In the purely mechanical universe envisaged by von Helmholtz there was an obvious connection between human and machine work. For him, Lebenskraft, as the Germans called the life force, was no more than an expression of “organisation” among related parts which carried no implication of a vital force.13 “The idea of work is evidently transferred to machines from comparing their performances with those of men and animals, to replace which they were applied. We still reckon the work of steam engines according to horse power.” Which led him to the principle of the conservation of force: “We cannot create mechanical force, but we may help ourselves from the general storehouse of Nature. . . . The possessor of a mill claims the gravity of the descending rivulet, or the living force of the moving wind, as his possession. These portions of the store of Nature are what give his property its chief value.” His idea of the “store” of nature complemented Joule’s notion of the “currency” of nature. While Mayer and von Helmholtz, being doctors, came to the science of work through physiology, von Helmholtz’s fellow Prussian Rudolf Clausius approached the phenomenon, like his British and French contemporaries, via the ubiquitous steam engine. In later life Clausius had a rather forbidding appearance: a very high forehead, rather hard, piercing eyes, a thin, stern mouth, and a white beard fringing his cheeks and chin. In fairness to him, this sternness may have reflected nothing more than the pain he was in continuously after suffering a wound in the Franco-Prussian War of 1870–71. At the same time he was a fervent nationalist and that may also have been a factor. But Clausius’s special contribution was to apply mathematics far more deeply than any of his predecessors, and his work was an important stage in the establishment of thermodynamics and theoretical physics. His first paper on the mechanical theory of heat was published in 1850. This was his most famous work and we shall return to it in just a moment. He advanced rapidly in his career, at least to begin with, being invited to the post of professor at the Royal Artillery and Engineering School at Berlin in September 1850 on the strength of his paper, then moving on to the Polytechnikum in Zurich, where he remained for some time despite being invited back to Germany more than once. He eventually accepted a chair at Würzburg in 1869, moving on to Bonn after only a year, when the Franco-Prussian War intervened. A “burning nationalist,” as someone described him, Clausius volunteered, despite being just short of his fiftieth birthday, and was allowed to assume the leadership of an ambulance corps, which he formed from Bonn students, helping to carry the wounded at the great battles of Vionville and Gravelotte—the Germans suffered twenty thousand casualties at the latter battle. During the hostilities, Clausius was wounded in the leg, which caused him severe pain and disability for the rest of his life.15 He was awarded the Iron Cross in 1871. Unlike Mayer and von Helmholtz, Clausius did succeed in having his first important paper, “On the Moving Force of Heat, and the Laws Regarding the Nature of Heat That Are Deducible Therefrom,” accepted by the Annalen. It appeared in 1850 and its importance was immediately recognized. In it he argued that the production of work resulted not only from a change in the distribution of heat, as Sadi Carnot—the French physicist and military engineer—had argued, but also from the consumption of heat: heat could be produced by the “expenditure” of work. “It is quite possible,” he wrote, “that in the production of work . . . a certain portion of heat may be consumed, and a further portion transmitted from a warm body to a cold one: and both portions may stand in a certain definite relation to the quantity of work produced.” In doing this he stated two fundamental principles, which would become known as the first and second laws of thermodynamics. This idea that heat was a form of motion was not new. In addition to the ideas of Joule and Mayer, the American Benjamin Thompson had observed that heat was produced when a cannon barrel was bored, and in Britain Sir Humphry Davy had likewise noted that ice could be melted by friction. What attracted Clausius’s interest was the exact form of motion that comprised heat. Was it the vibration of the internal particles, was it their “translational” motion as they moved from one position to another, or was it because they rotated on their own axes? Clausius was elected a fellow of the Royal Society in 1868, and awarded its Copley Medal in 1879. Others were attracted by his efforts, in particular James Clerk Maxwell in Britain, who published “Illustrations of the Dynamical Theory of Gases” in the Philosophical Magazine in 1860, making use of Clausius’s idea of the mean free path. According to one of his biographers, James Clerk Maxwell had a scientific idea “that was as profound as any work of philosophy, as beautiful as any painting, and more powerful than any act of politics or war. Nothing would be the same again.” These are big things to say, but, in a nutshell, Maxwell conceived four equations that, at a stroke, united electricity, magnetism, and light and in so doing showed that visible light was only a small band in a vast range of possible waves, “which all travelled at the same speed but vibrated at different frequencies.”18 Physicists, says the same biographer, honor Maxwell alongside Newton and Einstein, yet among the general public “for some reason he is much less well known.” This was all carried through while Mary Somerville was still alive and, in effect, helped make Connexions out of date. Maxwell was brought up for the first eight years of his life on his father’s estate at Glenlair, in the Galloway region of southwest Scotland. His family were well connected—his grandfather was a composer, as well as having various official municipal jobs, and a fellow of the Royal Society. An uncle was a friend of James Hutton and had illustrated Hutton’s seminal work, Theory of the Earth (see chapter 2). Maxwell’s parents had married late; their first child had died in infancy, and James’s mother was almost forty when he was born. Another poem actually had a graph in it. School continued difficult for a while, not helped by a hesitancy of speech verging on, but not quite, a stutter. And it contrasted strongly with his aunt’s house, which he loved. It was full of books, drawings, and paintings, and his cousin—his aunt’s daughter—was a rising artist, who even Landseer had complimented. At the age of fourteen Maxwell published his first paper. It was about how to draw an oval. Everyone knows that if you attach string to a pin and a pencil to the other end, you can draw a perfect circle. Maxwell observed that if you have two pins, with one piece of string attached to each, and then push a pencil against the string, so that it remains taut, you can draw a perfect oval. Then he undid one end of the string and looped it around the free pin, and got another oval, egg-shaped. He played with more curves and studied their mathematical relationships, coming up with some formulas to describe what he had found. Some of this had been worked out earlier by no less a figure than René Descartes, but Maxwell’s system was simpler and was judged good enough to be read before the Royal Society of Edinburgh. Because he was so young, the paper had to be read for him. He was a devout Christian, of the austere Presbyterian kind, something that paid off when he visited other Presbyterian relatives in Glasgow. One of his cousins, Jemima, had married Hugh Blackburn, professor of mathematics at Glasgow and a great friend of William Thomson, the new professor of natural philosophy there. Maxwell and Thomson struck up a friendship that would continue for years. As mentioned in the Introduction, in mid-nineteenth-century Britain the word “scientist” had not yet come into common use. Physicists and chemists called themselves “natural philosophers” and biologists called themselves “natural historians.” Maxwell decided to enroll at Edinburgh University, to study mathematics, natural philosophy, and logic. He matriculated at sixteen. This was when Maxwell himself began to experiment, aided by the practice of the Scottish universities of closing from late April to early November to allow students home to help with the farming. He read and read and read and carried out his first experiments at Glenlair, developing an interest in electromagnetism and polarized light. These DIY adventures did more than develop his experimental skill, though that was important. They helped give him a deep feeling for nature’s materials and processes that later pervaded his theoretical work. While in Edinburgh he produced two more papers for the Royal Society there. So, when he left for Cambridge at the age of nineteen, he had a solid body of knowledge, a handful of publications to his name, and some valuable and potentially influential friends in the world of academia and science. With the tripos out of the way, Maxwell was now free to give rein to the ideas that had been brewing in his mind over his two stints as an undergraduate. There were two aspects of the physical world he wanted to explore. One was the process of vision, particularly the way we see colors, and the other was electricity and magnetism. In his color research he had an early breakthrough, finding that there is a fundamental difference between mixing pigments, as one does with paints or dyes, and mixing lights, as one does when spinning a multicolored disc. Pigments act as extractors of color, so that the light you see after mixing two paints is whatever color the paints have failed to absorb. In other words, mixing pigments is a subtractive process, whereas mixing lights is additive—so that, for instance, blue and yellow do not make green, as they do with pigments, but pink. And by experiment he was able to show that there are, in light terms, three primary colors—red, blue, and green—and that it is possible to mix them in different proportions to obtain all the colors of the rainbow. This was a major advance and is the theory behind the colors in color television, for example. In this way, lines of force became the “field,” and this was the concept that set Maxwell apart and put him on a par with Newton and Einstein. More than that, he would build on it six years later with his concept of electromagnetic waves. In June 1858 he and Katherine were married and then, a few months later, he read the paper by Clausius about the diffusion of gases. The problem, which several people had pointed out, was that, to explain the pressure of gases at normal temperatures, the molecules would have to move very fast—several hundred meters a second, as Joule had calculated. Why then do smells—of perfume, say—spread relatively slowly about a room? Clausius proposed that each molecule undergoes an enormous number of collisions, so that it is forever changing direction—to carry a smell across a room the molecule(s) would actually have to travel several kilometers. Maxwell saw that what was needed was a way of representing many motions in a single equation, a statistical law. He devised one that said nothing about individual molecules but accounted for the proportion that had the velocities within any given range. This was the first-ever statistical law in physics, and the distribution of velocities turned out to be bell-shaped, the familiar normal distribution of populations about a mean. But its shape varied with the temperature—the hotter the gas, the flatter the curve and the wider the bell. This was a discovery of the first magnitude, which would in time lead to statistical mechanics, a proper understanding of thermodynamics, and to the use of probability distributions in quantum mechanics. This alone was enough to put Maxwell in the first rank of scientists. The Royal Society certainly thought so, awarding him the Rumford Medal, its highest award for physics. No less important in the long run, King’s College London was looking for a professor of natural philosophy—James entered his name and was appointed. And he still had more than one breakthrough in him. King’s, in the Strand, just north of the Thames, had been founded in 1829 as an Anglican alternative to the nonsectarian University College, a mile further north, which was itself intended as an alternative to the strictly Church of England Oxbridge universities. Unlike the traditional courses, to be found at Aberdeen and Cambridge, King’s’ courses were much more modern. Being in London meant that Maxwell could attend the meetings of the Royal Society, and the Royal Institution, where he was able to cement his friendship with Faraday. They had corresponded a great deal, but now at last met and struck up a genial friendship. And Maxwell homed in on his final great insight. As if all this were not enough, Maxwell’s equations contained within them the implication that there must be other forms of electromagnetic waves with much longer wavelengths than those of visible light. Their discovery would not be long in coming. The final chapter in Maxwell’s extraordinary career arrived when he was invited to accept an important new professorship at Cambridge. The duke of Devonshire, who was chancellor of the University, had offered a large sum of money to build a new laboratory for teaching and research, which was to compete with the best of what then existed on the Continent, especially in Germany. Cambridge was being left behind in experimental science, not just in France and Germany, but by many of the new British universities as well. It was only later, in 1865, that Clausius proposed the term “entropy” (from the Greek word for “transformation”) for the irreversible processes. The tendency for heat to pass from warmer to colder bodies could now be described as an instance of the increase in entropy. In doing this, Clausius emphasised the directionality of physical processes. Entropy was a counterpart of energy “because the two concepts had analogous physical significance.” Clausius set out the two laws of thermodynamics as follows: “The energy of the universe is constant” and “The entropy of the universe tends to a maximum.” Time, in some mysterious way, had become a property of matter. He took his doctorate at the University of Vienna, then taught at Graz before moving to Heidelberg and afterward Berlin, where he studied under Bunsen, Kirchhoff, and von Helmholtz. In 1869, at the age of twenty-five, he was appointed to the chair of theoretical physics in Graz. After that, Boltzmann had a very unsettled career—he changed professorships numerous times, more than once because he couldn’t get on with colleagues. The constant arguments depressed Boltzmann and he attempted suicide for the first time. Finally, in 1901, after all this chopping and changing, Boltzmann returned to Vienna to the chair he had vacated in one of his arguments with colleagues and which had not been filled in the meantime. In addition he was given a course to teach on the philosophy of science, which quickly became very popular, so much so that he was invited to the palace of Emperor Franz Joseph. In 1904 Boltzmann went to the United States and visited the World’s Fair at St. Louis, where he gave some lectures before going on to visit Berkeley and Stanford. While there he behaved oddly—people couldn’t make out whether his elevated manner was an illness or pretentiousness. He returned home and went on vacation with his family to Duino, near Trieste. While his wife and daughter were swimming he hanged himself. No one can be certain whether his general instability was the cause of his suicide, or the continual attacks on his ideas. What is certain, unfortunately, is that he couldn’t have been aware, at the time of his death, that his ideas would very soon receive experimental confirmation. The understanding of thermodynamics was the high point of nineteenth-century physics, and of the early marriage between physics and mathematics, building richly on Mary Somerville’s previous ideas. It signaled an end to the strictly mechanical Newtonian view of nature. It would prove decisive in leading to a spectacular new form of energy: nuclear power. This all stemmed, ultimately, from the concept of the conservation of energy. I. The inverse-square law applies when some force or energy is radiated evenly from a point source into three-dimensional space, like a lightbulb, say. Since the surface area of a sphere is proportional to the square of the radius, the emitted radiation (light in this example) is spread out over an area that is increasing in proportion to the square of the distance from the source. When you sit next to a light to read by, the phenomenon shows itself. If you move your chair so that you are twice as distant from the source of light as you were initially, the light diminishes by the square of that—i.e., 22: it is four times as dim.